Indonesia-based helicopter charter services company Jaya Trishindo made its trading debut on Tuesday (27/03), hence becoming the third company to have concluded its initial public offering (IPO) on the Indonesia Stock Exchange in 2018 (there are now a total of 568 listed companies in Indonesia). It is interesting to note that Jaya Trishindo is the first company that falls within the small and medium enterprises category to list on the Indonesia Stock Exchange. Shares of Jaya Trishindo soared 70 percent on its first trading day, closing at IDR 187 per share. Through the IPO the company offered 250 million shares to the public, equivalent to 30.53 percent of the company's total share equity, for a price of IDR 110 a piece. The management said Jaya Trishindo's shares were oversubscribed nearly seven times despite the high degree of uncertainty that is currently plaguing financial markets across the globe. Edwin Widjaja, President Director of Jaya Trishindo, said he sees growing opportunities for helicopter rental services in Indonesia as the nation's economy is strengthening, while the government's development projects increase. Moreover, the Indonesian consumer is increasingly becoming used to helicopter services, thus the market not merely consists of corporate customers anymore but there is an increasing amount of individual customers who opt for helicopter services. Those who rent a helicopter include corporate customers in the mining and agriculture sectors, VIP transport and medical evacuation. 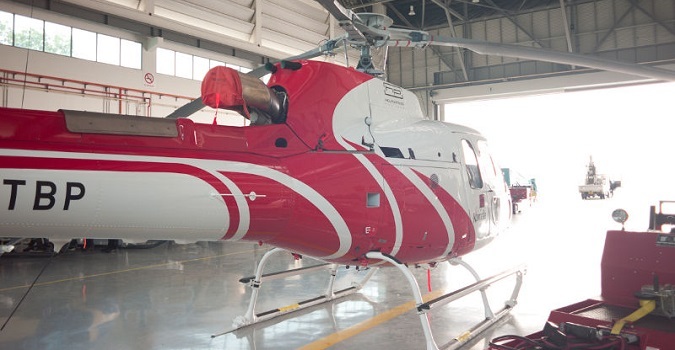 Widjaja added that the company plans to purchase two more helicopter units in a bid to boost revenue by up to 20 percent in 2018. Currently, the utilization rate of Jaya Trishindo's helicopters is above 70 percent. Through the IPO Jaya Trishindo raised IDR 27.5 billion (approx. USD $2 million). All the funds will be injected into the company's subsidiary Komala Indonesia. This unit will use 60 percent of the IPO proceeds for capital expenditure, in particular for the purchase of two new helicopters, while the remainder will be allocated to the company's working capital budget. One of the plans of the company is to develop new maintenance facilities with the aim to boost cost efficiency. UOB Kay Hian Sekuritas was underwriter for Jaya Trishindo's IPO. Prior to the listing of Jaya Trishindo only two other companies were added to the Indonesia Stock Exchange so far in 2018: telecommunication construction services company LCK Global Kedaton and coal miner Borneo Olah Sarana Sukses.